Status: sailed (2011-2013). Donated (2013). The first Abilyn, a Vanguard 15. As this was our first boat, we spent a considerable amount of time naming her even though her name was staring right at us through two sets of monozygotic eyes. Before combining the names Abigail and Dylan, we considered Zatara, the fictitious name given to Edmond Dantès in the film adaptation of The Count of Monte Cristo, meaning "driftwood" in no language in particular, to Artax, Atreyu's horse in Neverending Story who perished in the Swamp of Sadness, to Irukandji, the translucent, thumb-sized box jellyfish indigenous to Australia. Boats are living, breathing things and deserved a living, breathing name. After learning to sail on a J/24 in 2006 and spending the ensuing four years sailing and racing on New York Harbor, I was convinced to join Larchmont YC's very energetic dinghy sailing scene. In 2011 and even today, the V15 fleet at Larchmont YC is tremendously active, attracting young sailors out of college, who typically participate in both the V15 and Viper fleets. In 2011, we picked up Abilyn from The BoatLocker. Our girls were not even two years old. And although we never sailed with them on the first Abilyn, they had plenty of fun crawling in the cockpit and going for ride-alongs through the parking lot. 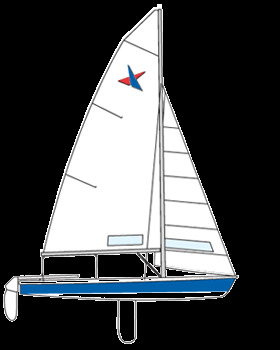 In 2013, we donated Abilyn to Sea Legs, a volunteer organization in New London, CT that introduces kids to the joy that is sailing. But before she was hauled off, we did manage to put the GoPro to good use. I never could get that boat to sail flat--no doubt on account of those baggy sails. Little boat. High Seas drama.